While the rest of the economy continues to struggle, life is good in LA – if you have building products that is. The LA Times reported that the LA Community College District awarded $400 million in contracts out of the $5.7 billion it has to work with. If you sell building products into educational facilities, you’re probably wondering what they need and how can you get your foot in the door. Here’s the next advertised group. If you don’t have your products listed on Green Building Pages. Do so now. Go here for more background. Good Luck! The Anaheim ConventionCenter in Anaheim, CA is the the location for 50 workshops and over 200 exhibitors. For more info go to: www.green-technology.org/gcschools or call 626-577-5700. 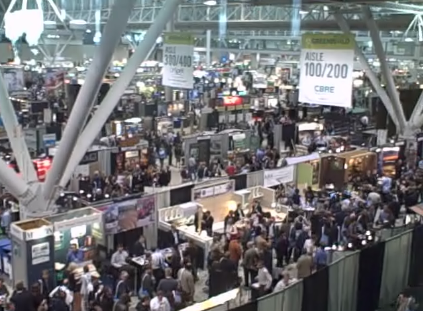 Greenbuild 2008 was all that it had promised to be – packed with potential (about 30,000 attending) to change the world through low energy, high performance products and buildings. The biggest “potential” came from LA Community College District. I felt like the tooth fairy being able to talk to vendors about the LACCD opportunity. “Hi, do you work with schools? I have $6 billion to spend…” It’s amazing how fast people smiled and asked you to step into their booth. Greenbuild already had an air of hopefulness due to the recent election, but there is nothing like cold hard cash during a tight economy to get companies engaged and excited again. Did you miss getting an invite? Go hereto have a full rundown on the LACCD opportunity and the how you can become involved. After “hopefulness,” “transparency” had to be the other key word covering the 3 days. On each corner, aisle and seminar, vendors spoke of Life Cycle Assessments, Third Party Audits and Sustainable Product Standards. Some companies floated their certification flags, others are holding off until a dominate standard comes forward, but everyone agreed that LCA’s are the future and that putting it in writing (whatever your shade of green) is where it all begins. With the passing of Measure J (for jobs) in the past election, LA Community College District added $3.5 billion to the bonds the school already had from previous years to bring the total budget up to $6.5 billion. The money will go towards 50 new buildings and modernizing hundreds of others up to LEED Platinum standards. LACCD is the largest community college district in the nation, serving 226,000 students yearly. The creation of these buildings brings purpose and mission together. Students learning about sustainable practices for their green job classes can touch and experience the very products that they may be working with later on after they graduate. Green Building Pages has joined this exciting effort. (this blog is part of GBP) It will provide the evaluation system for the buyers and specifiers of the building materials used in these buildings. It’s a unique site in that it’s free to the public, comprehensive in its sustainable information and rewards performance vs. advertising dollars. Companies with the most sustainable products, that can prove it through Life Cycle Assessment and third party audits will be listed at the top of selection lists. This is a very unique approach to a buying guide model where usually ad dollars do the talking. The more money, they higher on the lists products are ranked. In this case, Green Building Pages is encouraging companies to put their money into sustainable design and practices first. Because the site is free to the public, companies are charged a listing fee of $300 per product placement. If the products featured are to be part of the LACCD Master Bid contract, then the fee goes up to $800 to cover the cost of cross-promotion between LACCD’s E-catalog and Green Building Pages and many other promotions including to other school districts. Green Building Pages has been around since 2000, but it wasn’t until this year when it’s mission of providing full, transparent information has met the market need. Ironically, this year is also when the USGBC has made “fostering social equity” part of its guidelines. Luckily social equity is something that Green Building Pages has included since its beginning. For more information write Mary@GreenBuildingPages.com or go to Green Building Pages.